The Kirk have created a lovely website with history and information about their current events. This building has always been open for visitors but will now be locked. The key is available by arrangement. ‘The Ardchattan Kirk Session has asked Argyll presbytery for permission to sell Ardchattan Church and their request is currently under consideration. 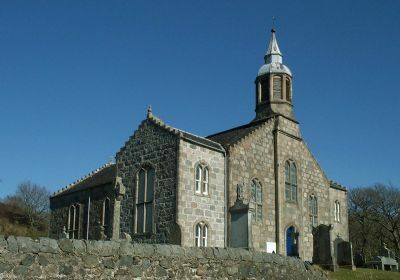 The Kirk Session has decided that the congregation’s other building, St Modan’s Church in Benderloch, would best serve their long-term vision and needs,’ added the spokesperson. Ardchattan kirk, built in 1836, serves the communities of Benderloch, Bonawe, Barcaldine, North Connel and surrounding areas. The Land was donated by General Campbell of Lochnell, and the building had cost the local heritors £1,100 to build, from granite and sandstone quarried locally. When completed it would hold 430 parishionners. There is a session room, a ministers room, as well as 2 for local heritors, including Lochnell. The long central communion table is a rare feature in current kirks in Scotland, the place where those who could not afford to rent a pew would have to sit. GD 170/514/3 The Burial Aisle and Mausoleum. Specification for finishing the aisle belonging to Barcaldine and building a mausoleum for the family of Barcaldine. John Drummon and James Lawson, masons. Specification for finishing the Heritors' Minister's and Elders' rooms adjoining the Church proposed to be built according to John Thom's plan. GD 170/2367/11 Proposal to build a new church at a more convenient place and repair the existing church at Ardchattan. Letter from Col. Robert Campbell of Ardchattan. He agrees to the proposal although he regrets the move. GD 170/2431/1 The new Church. Andrew Elliot writes that he is disappointed with the money he has received for his labour at Ardchattan Church. Letter to Sir Donald Campbell of Barcaldine. Letters suggesting that the old church might be repaired and a new church built in the most populous part of the parish, along with a new manse. General Duncan Campbell proposes that the plan should be put to the heritors. GD 170/519/4 Specification for building the new church. According to a plan submitted by John Thom. GD 170/2451/3 and 4 The Mausoleum. Letters from James Gillespie Graham. He is sending plan, elevations and a working drawing. The Arms are to be cut in Edinburgh so the mason must leave room for them.